Now here is a magical spray that waterproofs everything . you can spray the silicon-based spray onto anything like shoes , fabric , books , metals and almost on any other surface and the material becomes completely resistant to water . Rust-oleum’s liquid-repelling product , NeverWet was demonstrated in a YouTube video about a year ago . The video went viral instantly and was viewed about 4.8 million times . Viewers were simply amazed with what they got to see . In the video demonstration below you can see how this spray works wonders . The liquid hits the surface of the applied material and repels off instantly without leaving any trace . 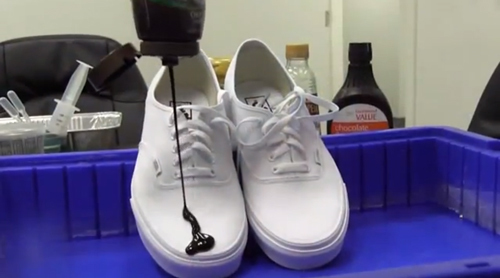 This highly superhydrophobic spray-on can repel water , mud , ice and many other liquids . The possibility of its use are unlimited and can only be limited by the users imagination . NeverWet is now available at Home Depot for $20 a can . We are really keen to try our hands on this product . But until we do that we have all reasons to be suspicious . NeverWet has a real WOW factor and has been grabbing customer attention like anything but it does have a few drawbacks too . It is not exactly the thing you would like to apply on any electronics . Check this video by PCPER and see what happened to this Raspberry Pi . While the product has numerous uses , But it must have its limits and we will know about them soon .Do you plan on buying this product ? and how do you plan to use it ? . do let us know in the comments below .